Personalized In Loving Memory Memorial Cross Garden Stone. Memorial Garden Stones are a great way to express your love, feelings and honor a family member or friend or pet forever. This a lovely way to pay tribute to a lost loved one or pet in a peaceful, natural setting in your family garden. The garden decoration can bring beauty to any home garden. With a Garden Stone you can really bring out your garden. 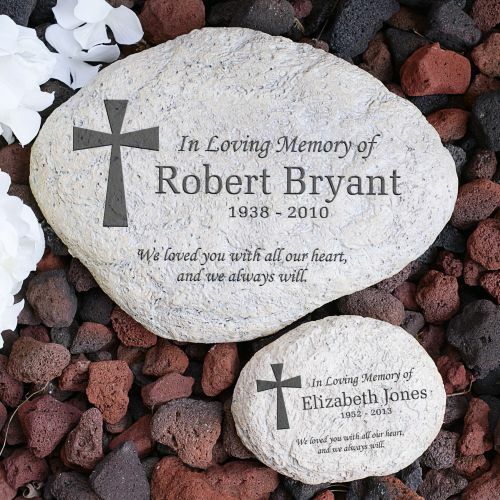 Make your garden special with a keepsake Garden Stone.. Memorial Garden Stones are a great way to express your love, feelings and honor a family member or friend or pet forever. This a lovely way to pay tribute to a lost loved one or pet in a peaceful, natural setting in your family garden. The garden decoration can bring beauty to any home garden. With a Garden Stone you can really bring out your garden. Make your garden special with a keepsake Garden Stone.